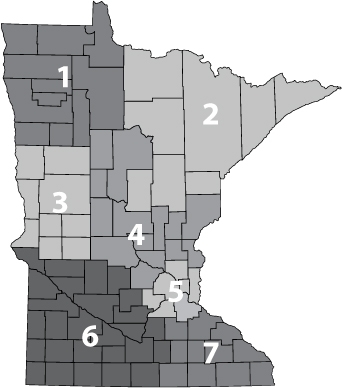 The Association has seven geographical regions, based on county groupings determined by the Board of Directors, which are organized for the purpose of member education and networking, and other local activities of interest to members. Quarterly, all MHCA region meetings are held on the same day. In addition to meeting with the colleagues in your region and discussing timely home care topics, MHCA will host a FREE 60-minute educational webinar, followed by an update from the MHCA Executive Director on all the regulatory and legislative activities affecting providers. Region Meetings are hosted throughout the state of Minnesota and is a members only event. This is a great opportunity to get educated, informed, and to meet with the colleagues in your region and discuss timely home care topics - all in one day! Click here to find the meeting nearest you. The webinar topics will be announced with the opening of online registration; 1-month prior to each event. Subject matters will be in the areas of regulatory/licensure, legal, clinical, and human resources. You must be a member to view and access all past region meeting recordings. MHCA region meeting recordings include a 60-minute educational webinar followed by regulatory updates from the MHCA Executive Director. Regional business meetings are not included with the recordings; instead, please refer to the region meeting minutes - this can be found on the individual region's page. Past Region Meeting education is available upon request. Please email mrubenstein@mnhomecare.org.